We are very grateful to our wonderful judges who generously gave us their valuable input. Thank you Mr Ken Smith (Artist, Former Lecturer, Art, Design & Architecture, Monash University), Ms Lesley Kehoe (Lesley Kehoe Galleries), Ms Susan Renouf (Adjunct Professor, Fashion & Textiles, RMIT University), Dr Yoshiho Kobayashi (Associate Professor, Outemon University; President, International Society of Ikebana Studies), Ms Hiroe Swen (Ceramic Artist, Former Lecturer, Australia National University) and Dr Osamu Inoue (Associate Professor, Kyoto University of Art & Design; Vice President, International Society of Ikebana Studies). 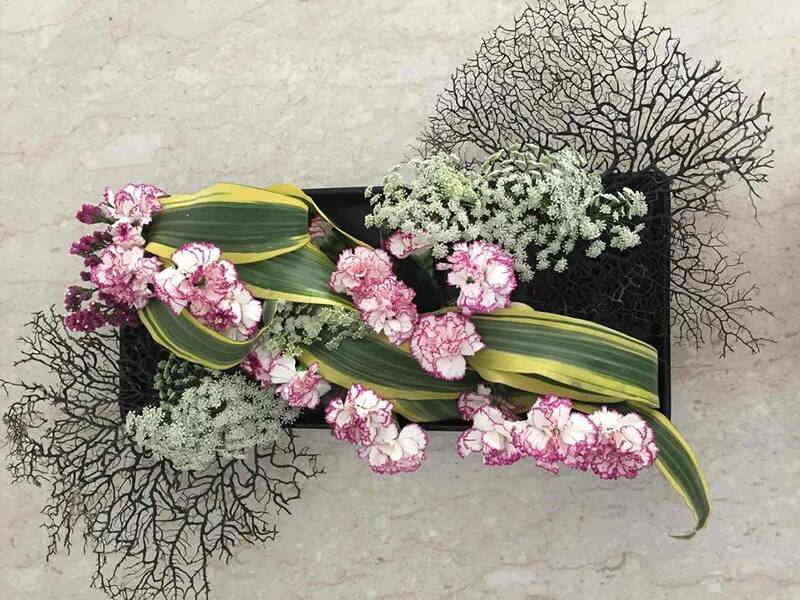 Their contribution made this award, the world's first online Ikebana competition truly unique. 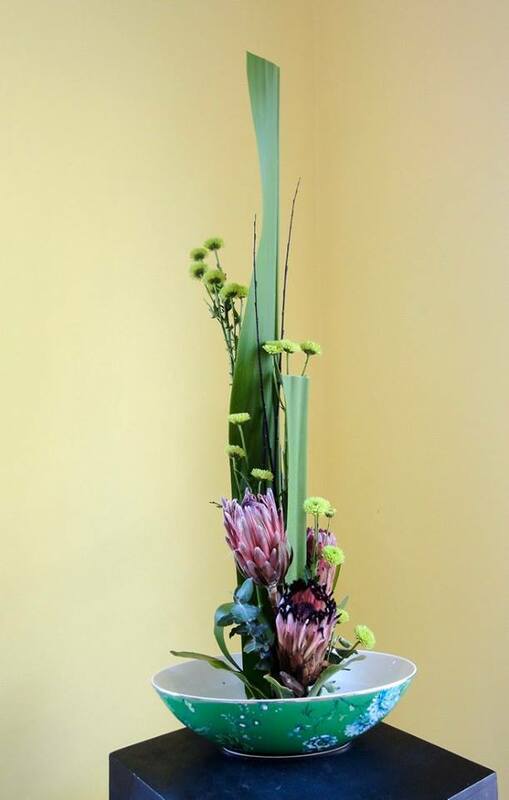 It is so rare for Ikebana students to be assessed and to receive comments from art specialists like our judges. Please visit the “Judges” page for their profiles. We are pleased to announce that the winners of Ikebana Galley Award 2016 are Mona Lisa, Jenny and Angy. 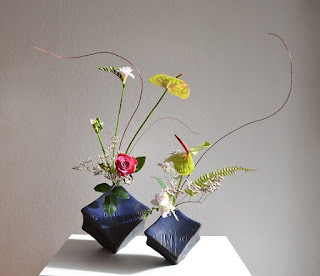 The three students will receive a certificate from Ikebana Gallery. We allocated 3 points to the first choice, 2 to the second and 1 to the third. The results were 7 points for Mona Lisa, 7 points for Jenny, 7 points for Angy, 5 points for Unnati, and 4 points for Pulcheria. Following are comments from our judges for each work. Mr Smith: This arrangement evokes energy and exuberance and does so by a clever balance of the repetition and contrast contained within the selected elements. Ms Kehoe: Third was very difficult ( I would have gone with the People’s Choice actually). In the end I chose Mona Lisa for interesting choice of materials. Ms Swen: This is so poetic, combining stillness and gaiety. Massage from Mona Lisa: It is a true honour and encouragement to be nominated among the winners of Ikebana Gallery 2016. Just participating at the competition, along the other talented participants around the world and my colleagues from Romania, provided me with the opportunity of belonging to a broader community which gathers ikebana enthusiasts and students, regardless their nationality, age, or Ikebana background. Therefore we were able to share our passion and get inspired by our best works, prepared with care and dedication for the competition. From this perspective, each participant is a winner! I would like to express my sincere gratitude for the organizers who paid the effort in managing dozens or maybe hundreds of works and to the panel of experts for analyzing our arrangements and giving us precious feedbacks and observations, which will make us take a step further on our way of self-improvement. I also thank from my heart to my teacher and mentor, Sorin Mazilu, who taught me that "Ikebana is a science of the heart and a genuine Way of living", and finding beauty and expressing it through the plants - living parts of Nature, it is also a way of inner development, as an artistic expression form. 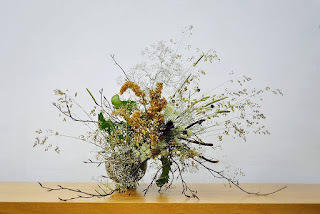 Even, as my teacher says, the best result we can hope in Ikebana is to send a ray of pure joy into somebody else heart, this result will encourage me continue my journey "on the Way of Flowers". Ms Kehoe: Second choice Angy for the challenge of working with pairing vessels. 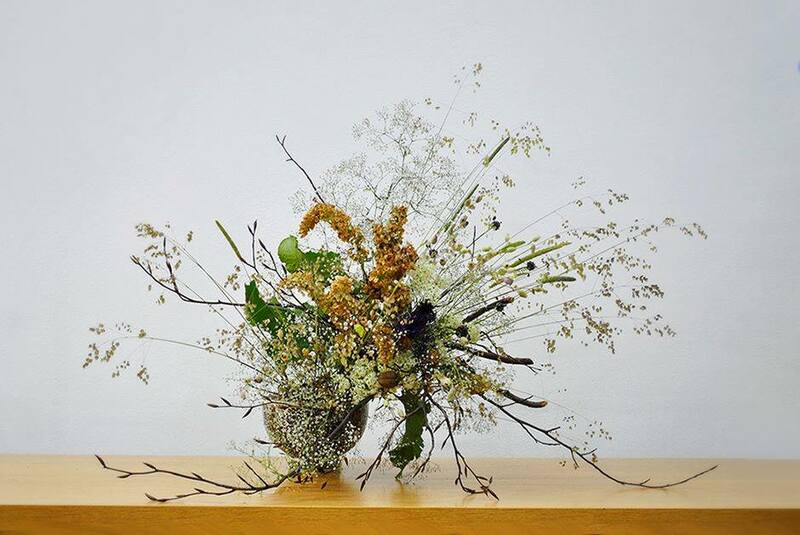 Message from Angy: I am very proud and pleased to see that I am among the winners of the Ikebana Gallery Award 2016. That is a great honour for me. On my Kado I got inspired by several teachers. The ones who impressed me most are Angelika Eisinger, Ute Girke and Prof. Manabu Noda. I am very grateful for their inspirations. All I know about Ikebana and all I can express through flowers is mostly dued to them. An Ikebana arrangement is a composition of the flower material and the vessel - therefore I would like to mention Mrs. Heidi Bereiter-Hahn, who created these unique wonderful pottery for me. My arrangement arised on new years eve 2015. After I had decided to spend this special evening with the activity I like most of all - doing an Ikebana arrangement. Solemnizing and displaying a little private firework. Thank you very much for the voting. Mr Smith: The deceptive simplicity of the combination of green leaf forms, presented here without flowers, accentuates their structural diversity and makes them more vivid. Ms Kehoe: I have selected Jenny as my first choice. 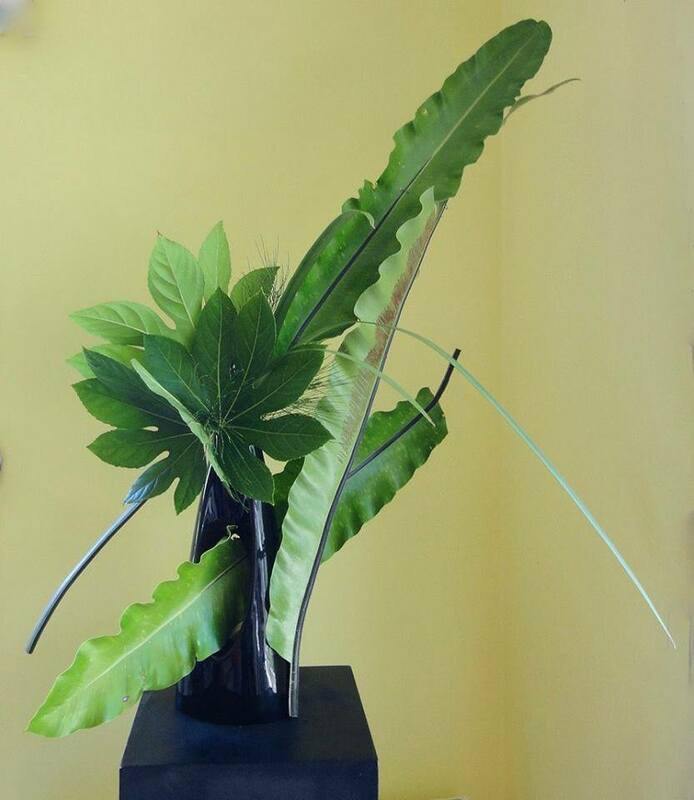 I admire the courage and innovation in choosing only green foliage and working with shape and textures. Ms Swen: This is a simple and bold work. I am fascinated by the expression full of living energy. Message from Jenny: I am so happy to be one of the winners of The Ikebana Gallery Awards 2016. I would like to thank my sensei, Shoso Shimbo San for entering my arrangement 'With Leaves Only'. Shoso sensei has inspired me to push myself. In this arrangement, I wanted to use different shapes and textures. I thought of the Samurai sword that is sharp and also God's word which is a double edge sword that can cut through everything. The pine adds some softness to the arrangement. 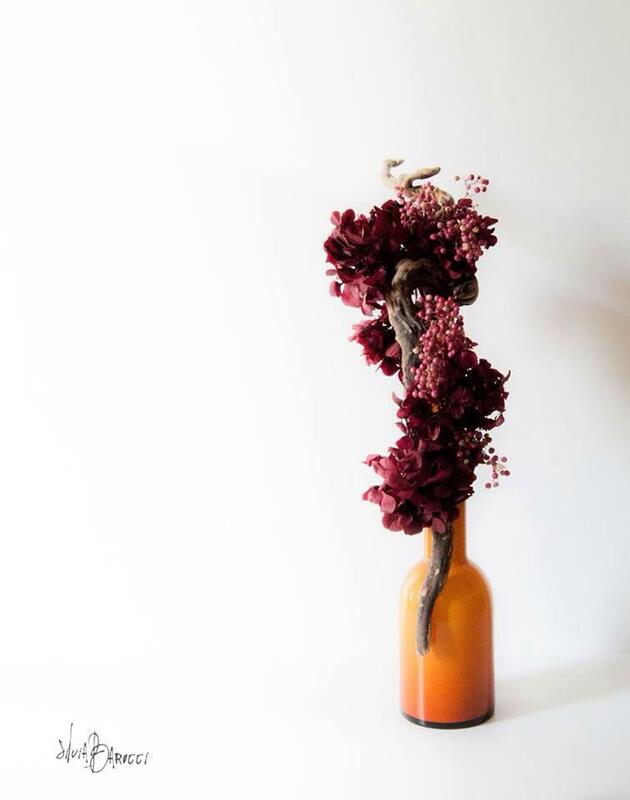 I wanted an arrangement that shows power and strength. Thank you all so much for this great honour. Ms Swen: This is a picturesque arrangement. I see the great potential for this student in the future. Ms Smith: The dominant vertical column of this arrangement combines forms and colours into a powerful expression of the life force contained within plants and suggests the creation of order out of randomness. Congratulations to the three winners, and to the other finalists. 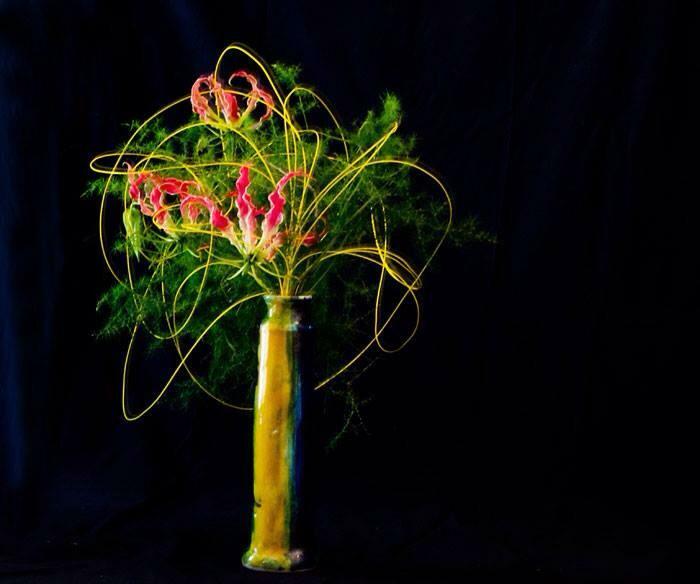 Thank you to all the Ikebana students who have shared their works on this blog. We are looking forward to receiving more images of your works for the Ikebana Gallery Award 2017.